For twelve long years, the Republican Party has held uninterrupted control of the White House. Despite a great US victory in the Gulf War, unemployment rises throughout the nation. 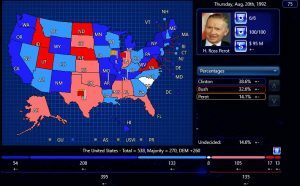 And with opposition from factions of the right and left, as well as the strong third-party campaign of Ross Perot, incumbent President Bush’s reelection chances appear uncertain. Will the United States vote to change course, or will the Republicans continue holding the White House for four more years? 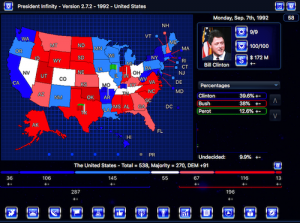 Play as any of several candidates from the ’92 campaign, with hypotheticals! Mario Cuomo was widely assumed to be the Democratic frontrunner prior to announcing his intention not to run. What if the liberal New York governor threw his hat into the ring? Friction ensued when Bob Casey, the outspoken pro-life governor of Pennsylvania, hesitated to endorse the Clinton/Gore ticket and was not allowed to speak at the Democratic convention. What if Casey himself entered the race? Conservative politico Pat Buchanan challenged incumbent President George H.W. Bush and lost. What if he had carried the torch for the GOP? Features include additional candidates and real-life events, including Perot exiting and reentering the race, Clinton’s infamous “Sister Soulijah” comments, LA riots, and more. My version 1.0 of the 1992 campaign! At this point I have only included the 3 main candidates and their veeps. Of course I “backdated” the correct electoral votes. Region percentages were taken from the real election data. I kept most of the main issues, removed some that are only for 2016. Added two issues: NAFTA and Business Policy. Future versions I will add more primary candidates. 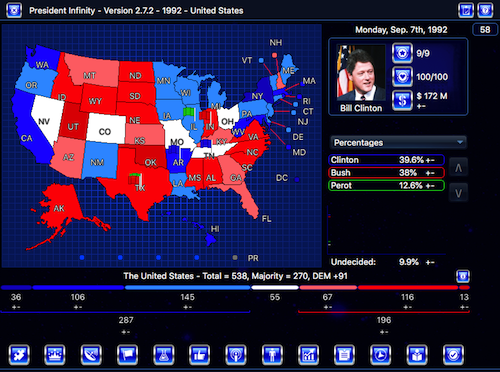 I’m working on a historical (with ahistorical options) for the 1992 Presidential election. You can download and play the alpha version here. Please note that this is nowhere near complete. Many features from the 2008 Beta are still in this game. -My apologies for not updating sooner! I will try to update more, but in the meantime the new version has the Republican primaries completed — at least the dates are. I haven’t found delegate counts yet but this will suffice. Note that some states did not have primaries in 1992 and they still do not in this scenario. There may be some other edits but I simply don’t remember them. -Oh, it looks like I added some issues as well. 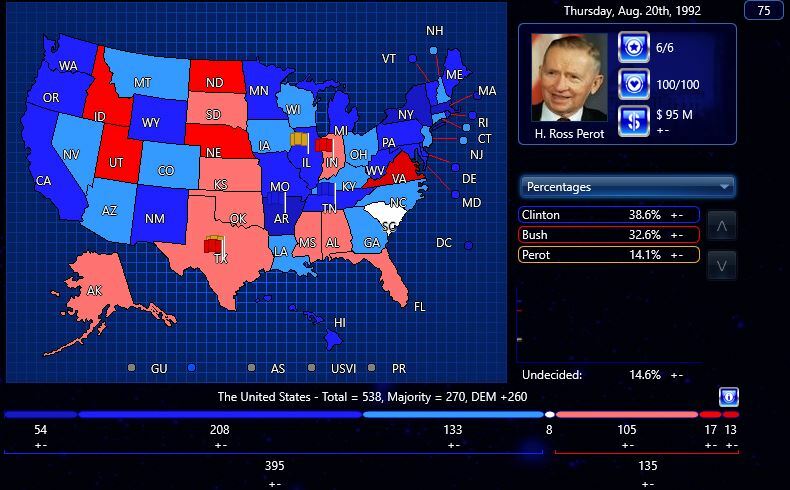 -Finished a lot of background numbers — electoral votes, 1994 state partisanship spreads (as best as I could allocate it). I used 1994 b/c I can’t find 1992. -Finished all Democratic primary numbers. Note, the starting cash amounts for Democratic candidates is cash on hand on October 1st 1991. -Started GOP primary numbers, still a work in progress. Also, I plan on adding a slew of characters, updated endorsers, updated issues, etc.